Support your loved one with this great Personalized Multiples Sclerosis Awareness Hoodie, whether it’s your Mother, Father, Sister, Brother, Friend or any loved one you know battling with MS. With any Multiple Sclerosis Walk Event, you along with family and friends can show your support and help raise awareness together. Our Personalized MS Awareness Shirt is available on our premium cotton/poly hooded sweatshirt, machine washable in youth sizes S-L and adult sizes S-2XL. Includes FREE Personalization! 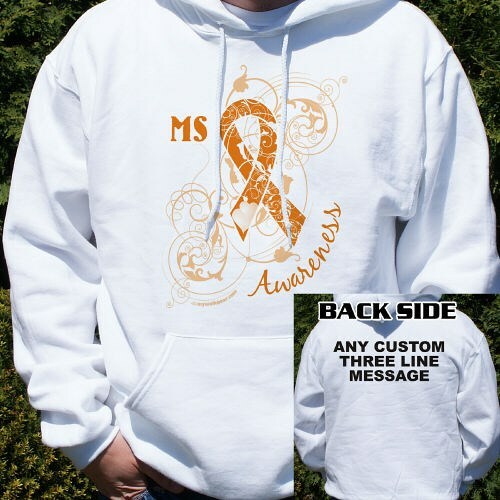 Personalized your MS Awareness Hoodie with any three line custom message on the back. Great looking shirt! I love it! Good job guys!! Wish the personalized writing on back was down further under hood. Very nice and quick ! Screen print in front was noticeable. OK for me I am not a critic So for me it's very nice! I did not know this was just screen printed. Additional Info Multiple Sclerosis affects approximately 400,000 people in the US and an estimated 2.5 million worldwide. By showing awareness, you will help support MS and also help fund research for a cure. Wear this Personalized M.S. Team Walk Sweatshirt or our Personalized M.S. Team Walk T-Shirt at your next Multiple Sclerosis Walk Event and be sure to bring along our Personalized MS Awareness Water Bottle to show your community who you are walking for. For all your Personalized Multiple Sclerosis Walk Apparel and Gear, shop MyWalkGear.com today.